Montreal, February 28, 2007 – Imagine. Imagine going on the trip of your life … dog-sledding on the world-renowned Yukon Quest Race Trail, in the heart of the Yukon. Imagine, you are a teenager with cancer and you’re going on this trip with 11 other teens and young adults who also live with cancer. 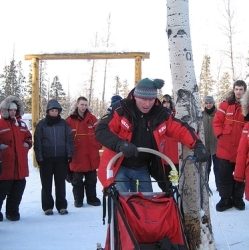 The Yukon expedition team leaves on March 3 and returns on March 12. The team will fly to Whitehorse and learn all about their surroundings and duties, and most importantly, how to drive dog-sleds and care for the dogs, camp in tents and live together in the wilderness. There they share their worries, their hardships, their apprehensions of what the future holds. They return sharing their new-found self-esteem, memories of their courageous expedition and confidence in what tomorrow might bring. On the Tip of the Toes Foundation is celebrating its 10th anniversary. Since 1996, the Foundation has been organizing therapeutic adventure expeditions for teenagers living with cancer. The idea was originated by a pediatric oncology team at The Montreal Children’s Hospital (MCH) of the McGill University Health Centre who wanted to motivate teens to meet the challenges of life outside the hospital and sought the help of outdoor adventure experts. Shortly thereafter, Mario Bilodeau and François Guillot, respectively Professor of Outdoors Adventure and Tourism at Université du Québec à Chicoutimi and Director, Parcs nationaux des Monts-Valin et de la Pointe-Taillon, became involved co-founders. They asked Annick Dufresne, now Managing Director of the Foundation, to create a non-profit organization. In the words of Amandine Johnson, teen participant in the 2004 winter expedition to Chic-Chocs in the Gaspé, “The expedition gave me so much hope for the future and allowed me to express my true feelings about my challenges living with cancer. To have had the opportunity to meet and to share with so many incredible people was a real gift and a source of inspiration -- to live life to the fullest and to begin to live like before my diagnosis. During my treatments, I felt it truly difficult to talk about what I was going through. On the trip I felt I could let my feelings out. Now I have a new perception of being a cancer survivor. It means that I can accomplish anything I put my mind to – if I have faith and perseverance. I’ve realized that my cancer will not prevent me from realizing my dreams.” And so the Foundation’s goals are being achieved. Each expedition involves five objectives that concern not only the teens but also the supervising staff: guides, doctors, nurses and educators. These objectives can be summarized as therapeutic, physical, cultural, geographic and educational. One of the educators has become so involved with the Foundation’s mission and so attached to the courageous teens that he has been on a dozen trips since 1997. Bertrand Dupuis, certified child life specialist and interim clinical leader of the MCH Child Life Program, loves interacting with, guiding, and encouraging sick children of all ages in his daily work at the hospital. “But for a couple of weeks every year on these trips, I am reminded of the real passion I have for my profession, for wanting to help sick children get better and feel better about themselves, and for the value of changing one’s everyday environment,” he said. “I particularly remember Marie-Hélène Côté, who participated in the 2000 expedition to Ellesmere Island and who has since died. Marie-Hélène shared with us her enormous pride having been able to reach the summit of the mountain after several tiring days of hiking. She had just finished her cancer treatments four months before the trip. I am certain that her self-esteem and inner strength helped her face what the future held for her two years later,” Bertrand Dupuis added. Three of the 12 young adults participating in the Yukon expedition are patients of the MCH. In fact, The Montreal Children’s Hospital Foundation was the first to offer financial support to the On the Tip of the Toes Foundation at the very beginning of the expeditions. The MCH Foundation helps finance a portion of the participants’ trip. The other teens are from l’Hôpital Sainte-Justine, le Centre universitaire de santé de l’Estrie and the Centre hospitalier de l’Université Laval; the IWK Health Center in the Maritimes, and the Children’s Hospital of Eastern Ontario and The Hospital for Sick Children in Toronto. The On the Tip of the Toes Foundation has organized over 15 trips involving some 150 teens, 34 of whom are/were patients of the MCH. Depending on the type of expedition, the youth discover nature through hiking, sea kayaking, canoeing, dog-sledding, snowmobile or snowshoeing. The trips have included Ellesmere Island and George River in Nunavut, the Fjord du Saguenay, Anticosti Island, James Bay and Hudson Bay, and the Magdalen Islands in Quebec; Albany River and the Polar Bear Provincial Park in Ontario; Gwaii Haanas National Park and the Queen Charlotte Islands in British Columbia, among others. Imagine … some dreams do come true.